Recently, we submitted a survey and our followers mentioned Too Much Tuscany as one of their favourite websites to find travel information about Tuscany. We know that Valentina Dainelli, the curator and founder of Too Much Tuscany is a big fan of Tuscany, so we asked her some travel inspiration tips. 1. How and when did you decide to explore Tuscany? I was born and raised in Tuscany and I love to say I'm 100% Tuscan. I started explore my beautiful region when I was a child with my parents. We loved going out to visit new places, especially small hamlets in the surroundings of Florence. Since then I've always traveled around Tuscany to discover more and more. I can never get too much of Tuscany, because it's full of hidden gems, stories and legends to listen, museums to visit and food to taste. It's a marvelous world! 2. What did you find in Tuscany that you didn’t expected? There are quite a few places I didn't expect to see in Tuscany. First off it's the Tarots' Garden in Maremma: a large colorful sculpture park created by French artist Niki de Saint Phalle, who got inspiration from Gaudi's Parc Guell in Barcelona. 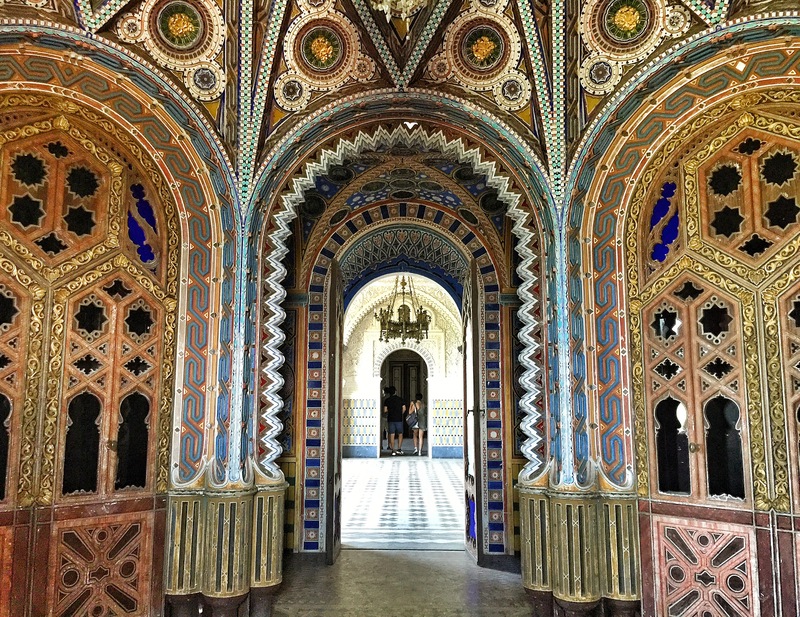 Second surprise was the Castle of Sammezzano, that looks like the castle of the Tuscan Arabian Nights. It's located in Leccio, next to the most famous Desginers' Outlet The Mall. Last but not least it was Autumn inside the National Park of Foreste Casentinesi. The colors are simply amazing and have nothing to envy to Canada! Red, orange and yellow color everything around you and you're surrounded by an evocative silence. The only thing you have to do is walking and taking pictures to taste the quintessence of Tuscan beauty. 3. Which are the top 3 experiences to have in Tuscany? climb up the Duomo and get on top Brunelleschi's Cupola! This is definetively one of the best views ever, not just in Florence, but in Tuscany all. In addition you can take great pictures of the city. Take a walk on a Sunday morning in small off-the-beaten path towns, like Suvereto. Sundays are just perfect day to blend in with locals, who are going to the Church or to the local giornalaio (newstand) or just sit in the main piazza to chat. I call it Dolce vita! Eating local food. I think that nothing is better to experience a place than eat good local food. It gives you the flavor of real life. Therefore you should taste roasted bread with extra virgin olive oil, Florentine steak, pappa al pomodoro, schiacciata and handmade pasta with wild boar sauce. 4. What is the best way to explore Tuscany and why? This is another difficult question and I have to give at least two different answers. First answer: car is the best way to explore Tuscany if you want to be independent and move quite quickly from one place to the other. Public transportation in Tuscany (and Italy) are not the best, especially if you want to explore minor areas. Second answer: the best way to explore Tuscany would be by bike, train or on foot. If you travel slowly you can experience everyday's life, see stunning places, go off-the-beaten path and meet lot of people! 5. Tell us your personal top 5 Tuscan foods you can’t do without? Well, I've already answered to this question but I'd love to remark that I can't do without extra virgin olive oil, that is just the perfect topping for fresh bread and vegetables. I can't do without bistecca or Florentine steak, as well as pappa al pomodoro that my nonna used to cook for me any time during the day when I was a child. Last but not least I can't do without schiacciata, kind of salted pizza-bread, and frittelle di riso as a dessert. These are for sure my top 5 foods in Tuscany! 6. What are the 3 events not to be missed in Tuscany? Mercantia in Certaldo. It's held in July within the medieval center of this lovely hamlet, that for a week becomes a magical castle with many International street artists performing around the streets. Palio of Siena. It's one of the oldest and most significant events in Tuscany (and Italy). It's not just a horse race, but it's kinda of a religious celebration for Siena and it could be a touching experience also for foreign people. Rificolona in Florence. Every year on September 7th by night the streets of Florence and few other towns in the surroundings are lighted up by hundreds of small paper lanterns made by children. This folk event dates to back long time ago, when farmers used to come to Florence to celebrate the Virgin Mary's Nativity on September 8th with their lantern. 7. Which is your favourite place in Tuscany for a romantic getaway? In Summer I love to wait for sunset by the sea. One of my favorite places by the sea is Castiglioncello near Livorno. Actually it's on top of the watch tower of Castiglioncello that I said 'I love you' to my husband for the first time. There are many romantic spots like Punta Righini, as well as romantic reastaurants like Il Cardellino. In Winter I love to take an hot bath at the natural thermal springs of Saturnia. Cold outside, hot inside. 8. Is there a Tuscan expression that makes you smile? Brindellone is one of my favorite. We use it to describe a very tall young boy/man, who is generally a good person. This colloquial word originated from the traditional Easter kart that every year brings the colombine to the Duomo. 9. Can you tell us a figure, past or present, who represents Tuscany? Mamma mia. There are way too many important Tuscan figures (Michelangelo, Leonardo da Vinci, Lorenzo de' Medici, Dante Alighieri and so on). Anyway if I think about one single person I think to Filippo Brunelleschi. That man was simply a genius. He built one of the best architectures ever: the Cupola of Florence Cathedral. Scholars are still studying how he built the largest dome ever. In addition he also invented one of my favorite plate, i.e. the peposo all'imprunetina. Legend has it that he used to prepare it while he was cooking the red bricks to cover the cupola, putting the pot right next to the bricks. 10. In one word… Tuscany is? Tuscany is love. It's toomuch love for me. I lived abroad and in other part of Italy, but Tuscany is the best place ever for me. Ciao I'm Valentina Dainelli and I'm a freelance travel writer and Social Media Specialist (+mum) 100%Tuscan. I love my dolce vita in Tuscany and write about it on TooMuchTuscany. I love writing about off-the-beaten path destinations, art & culture and food of course!